How many of you have had or currently have achy shoulder(s) or know someone that has experienced this? As an exercise scientist & athlete I don’t accept lasting pain for myself or others. During personal training sessions at Energy Fitness with our clients I often refer to an app on my phone called trigger points to help clients find the origin that the pain is referring from to help alleviate pain. When you feel pain in one part of your body it is most often a referral pain from another part of the body. Example: You wrists hurt as your job requires that you type often on a computer. It’s most likely your forearm muscles that are overworked or tight. 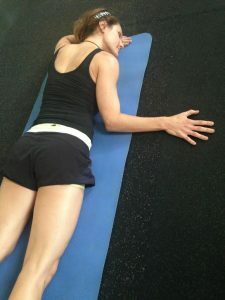 Since this blog post is about shoulder pain, I must tell you that the stretch below is my all time favorite stretch for the shoulder area for that burning ache from rotator cuff that just won’t ease up. Our current lifestyle of being hunched over desks, work stations, cell phones, smart tablets, holding the steering wheel, carrying heavy purses, and backpacks, sleeping on your side(s), or just holding your arms in the crossed position, etc.. makes our shoulders rotate out of proper anatomical position. See pictures to the left for proper anatomical position? Stand in front of a mirror and place your hands down by your sides comfortably. Where are your arms and specifically your palms facing? Are your palms touching the front of your body near your thighs? If you answered yes, then you may be likely to suffer from poor posture, shoulder pain and possibly tight chest and bicep or triceps muscles. Chances are you could use posture improvement. 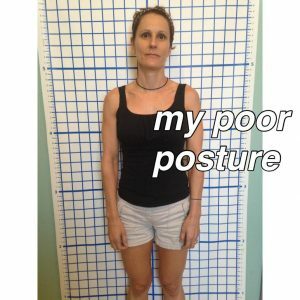 I always struggle with improving my posture as several sports I perform on a regular basis work against my posture such as running, swimming, cycling, and kayaking as well as some desk sitting. Some occupations such as dental hygienists develop chronic pain in which they just learn to accept as normal. No pain should be just accepted as it’s your body communicating with you to do something to counter the movement with a body aligning stretch or exercise. See stretch below to see how you can get almost immediate relief for shoulder pain. I originally did this stretch in bed and held for about 5 minutes. As you can see my face is facing the same direction as the arm I am stretching, however you can turn your head in the other direction if you also want to stretch the muscles in your neck. I must tell you that at first this stretch does not feel great if it’s really tight. My advice to you is to hold the position in picture on the left for 2 or 3 minutes then progress to picture on the right and hold additional 2 minutes or longer if you have the time. Try doing both arms at the same time, it’s a little intense especially if you put your chin on the floor so you are also stretching the scalene muscles (neck muscles along the sides or your neck). What’s the difference between the pictures? The picture on the right shows pushing the elbow closer to the floor which is a little more intense. Try to avoid rounding the shoulder to the floor. Here’s motivation for you to continue everyday or at least every other day. Fact: It takes 3 minutes every day for 6 weeks stretching for a muscle to physiology lengthen. How can you remember to do it once it stops the chronic pain? Place a note on your toothbrush so you can see before bed or in the morning, put a note on the mirror, in your closet, set your phone to alert you, what ever your method just make time for it everyday. Below is an extra stretch you may want to do to compliment the stretch above. Try counting to 90 twice and visualize the muscles lengthening. Don’t live in Memphis? 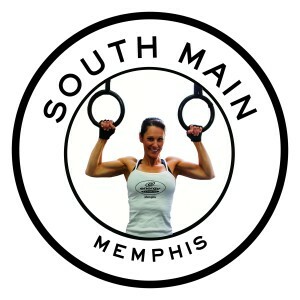 Purchase one of our training plans with meal plan(s) included for only $28. Click here for more info. and purchase page. Text Neck-OMG, Tips & Stretches to fix it!